Saturday began with clouds and less wind... but not still. Bruce and I were expecting Brittney and Layla (our granddog) to arrive before breakfast. 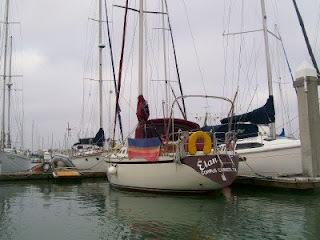 We took advantage of the lesser wind and went for a buzz around the marina in the dinghy. We looked at all of the boats and went for a quick jaunt outside so that Bruce could open the outboard up and get the cobwebs out. It was a great morning for bird watching! 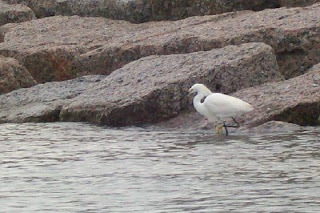 We saw this beauty looking for his food along the breakwater. You've gotta love a guy with yellow feet! 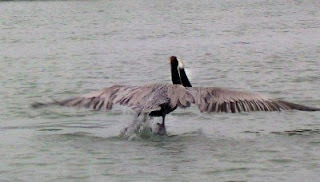 This pelican was just taking off from a fast meal when we found him. 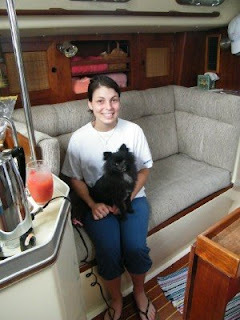 We brought the dinghy back to the boat and began tidying up a bit for Brittney's visit. We had just begun to worry about her when she showed up in her jammies with our granddog, Layla! I had grown tired of waiting and started working on breakfast so it worked out just fine. She arrived just in time. Me and my bacon became Layla's new best friend. 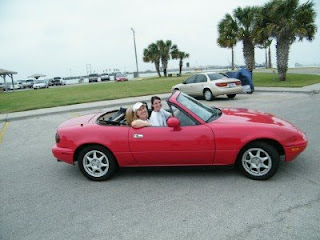 After breakfast, Bruce enouraged Brittney and I to take his Miata and go out shopping. 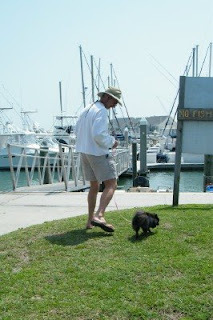 I couldn't let him down so reluctantly... off we went leaving Bruce at the boat with Granddogdaddy duty. We hit the local stores and bought some miscellaneous stuff, then came back to the boat as the sun came out. 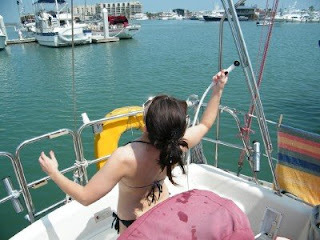 We hurried into our swimsuits and hit the deck! It was a gloriously sunny (and hot) afternoon. It was the first day of my staycation that could be described as such! Finally!!! 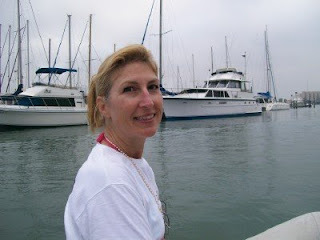 I took possession of the dinghy dock. We drowsed and read. It got so hot that we had to use the deck shower to cool off. As the afternoon wore on... our thoughts turned to dinner. We got dressed and packed up our stuff...then off to Hooks for a quick bite. Hooks has an outdoor patio and they allow dogs there so we took Layla in. 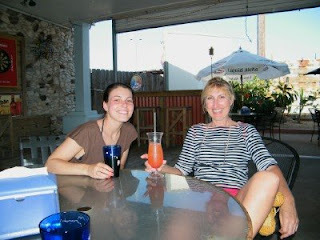 I had a scrumptious Rum Punch! This brought our day to a close. We went back to the house for the night.